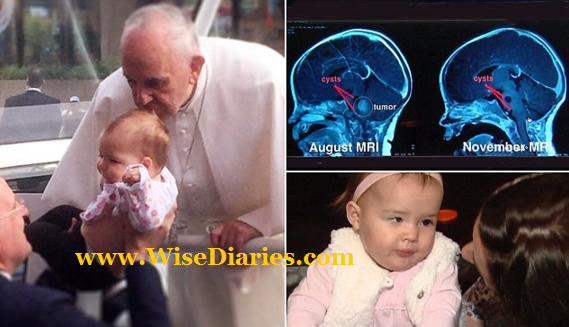 JIANA, SURVIVES - POPE’S BLESSINGS SAVES AN INFANT`S LIFE! Little Jiana, a one and a half year old infant of parents from Pennsylvania, America. She had been recognized of having a tumor at the back of her head in her small age. The parents who took efforts in many ways to make their little one get cured. They were being told that she had only couple of weeks left to survive from this sad situation. Pope in his visit to American citizens, crossed by the streets where little Jiana waited on the way to get His blessings. As Jiana was kissed on her head by the Pope, it reports that she was blessed by the guardians to get through herself from her fight against the tumor. The doctors said, her condition was getting better and she is back to surviving status. The dream of her mother came true. Happy family they together became, the blessings and the religion’s beliefs kept their lives attached. Emotional and true.